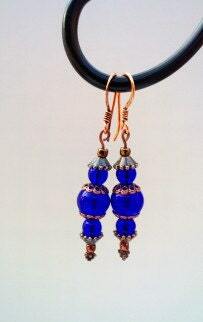 Long, dark blue earrings, that present in such a rustic, vintage fashion. Can easily be worn dressy or casual. With a color so deep, you can be sure to grab them with any jean outfit! The dangle part of these earrings measure approximately 1.5 inches in length.